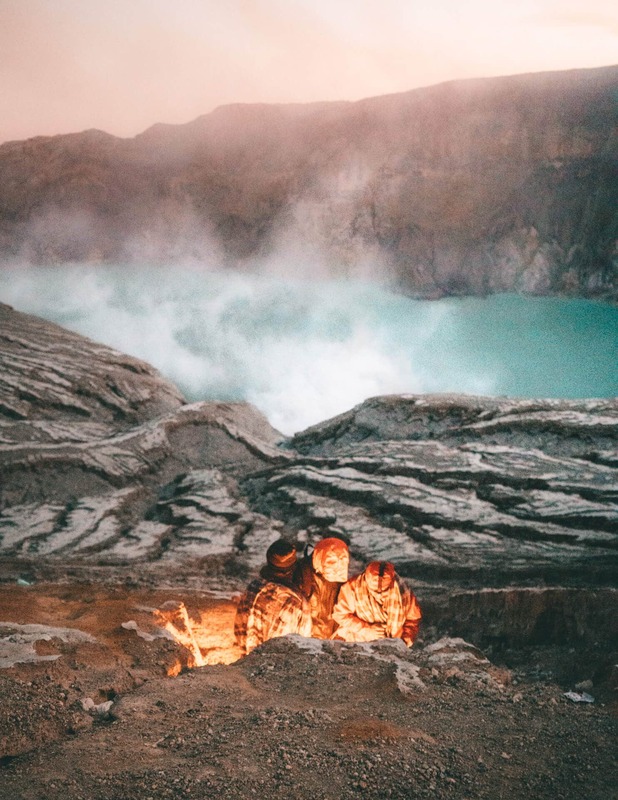 Ijen is a mining crater for sulfur miners. 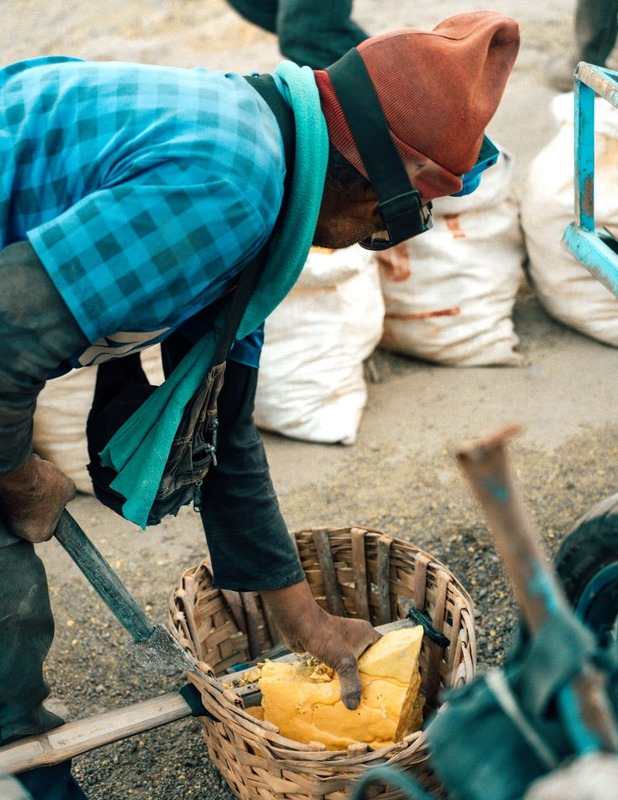 Day and night workers are transporting big chunks of sulfur. Sulfer is mainly used for skin care products. 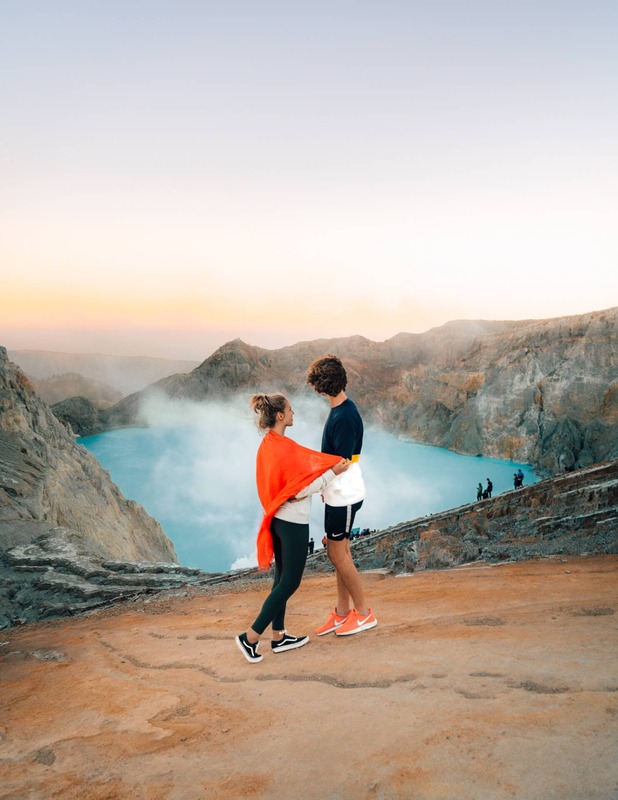 Going into the Ijen crater to see the ‘blue fire’ and the sunrise over the aqua blue crater lake is the reason to visit Ijen. Ijen has last been active in 1871 and is one of the most acidic places in the world. This is everything about an Ijen tour. East-Java is world-famous for its hikes at Bromo and Ijen. 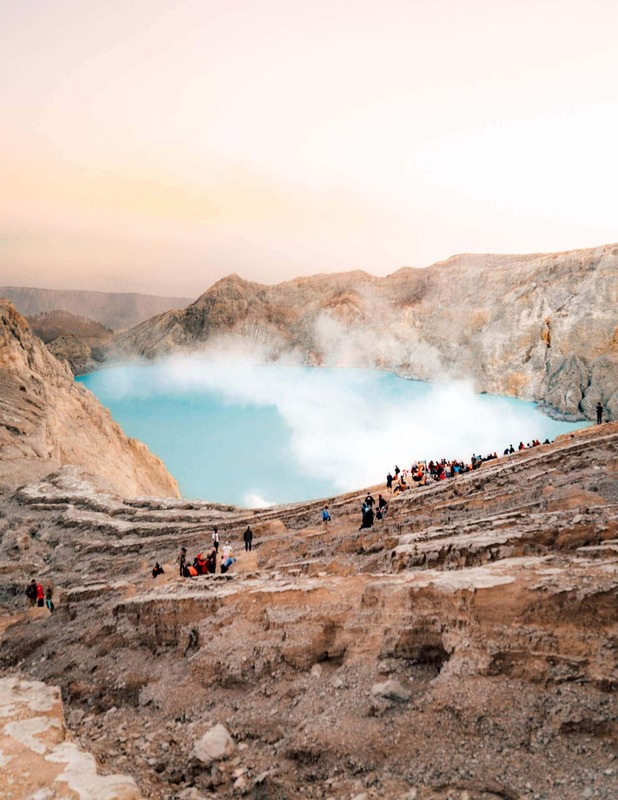 It is common to visit both volcanos in a 2-day Bromo and Ijen tour. 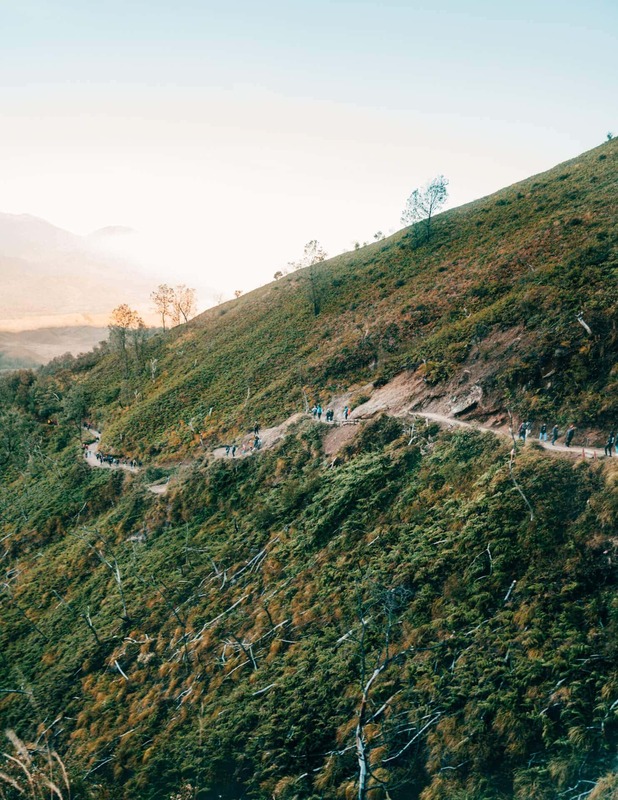 The hike to the top of Ijen is definitely challenging. It takes about 1,5 hour to reach the crater lake with some very steep steps. The good thing is, there is a well-marked path. You don’t have to worry to get lost while walking in the dark. Imagine these miners going up and down, with 40-70KG on their shoulders, doing that same walk for 3/4 times a day. Oh, and they earn 900 IDR (0.06 USD) per kilo. The entrance fee at Ijen is 100.000 IDR (6 USD) during the weekdays and 150.000 IDR (10 USD) in the weekend. Tip: It can be very windy, plan to take a scarf to cover up from the dust on your way up. Blue fire is a natural wonder that can only be seen at Ijen and in Iceland. It is only visible in the extreme darkness. If you are planning to witness the blue fire, you have to start walking from 2 AM. Once at the top you have to decent again into the crater, wearing a mask to find the blue fire. We didn’t do this ourselves. During our 8-day Java Route, we talked to a handful of people who hadn’t great reviews about this experience. We choose to spend more time at the best waterfall in Indonesia instead. Tip: They rent gas masks at the bottom and top of the crater. 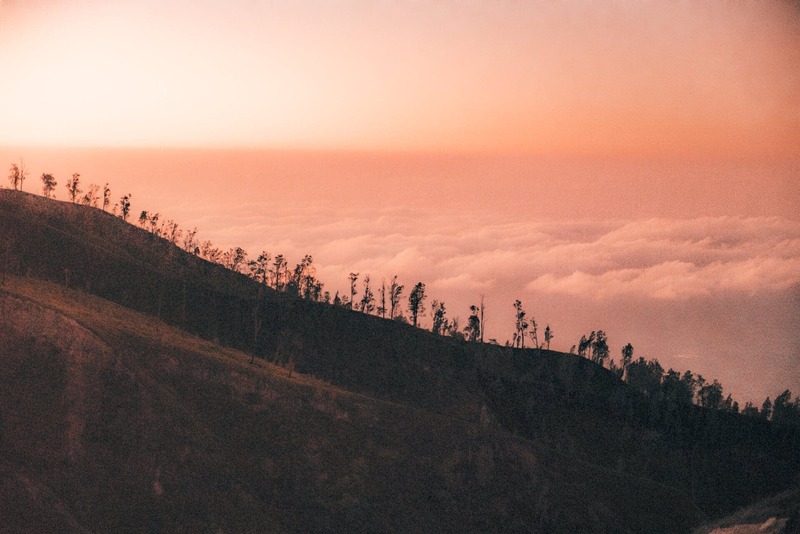 Watching the sunrise on the aqua Ijen crater lake is beautiful. 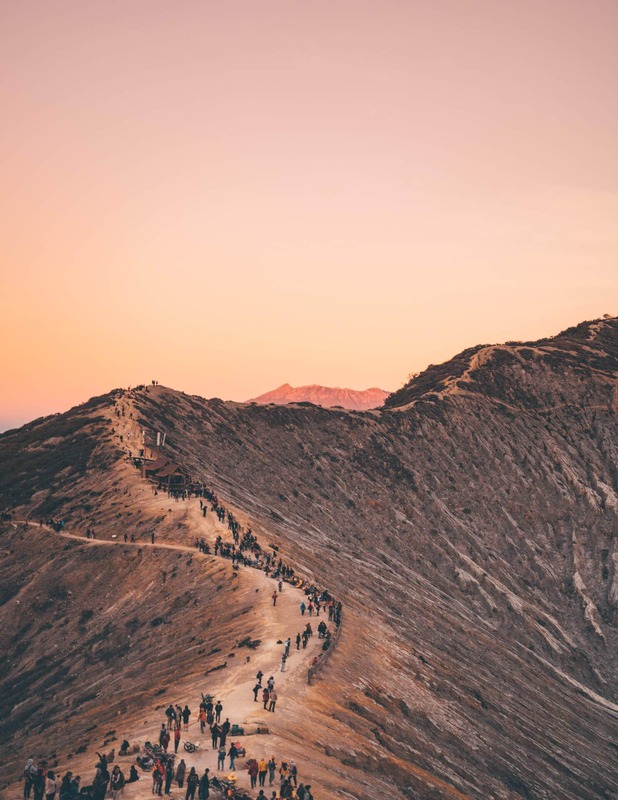 Just like Bromo, it is busy but you can walk around almost the whole crater lake to take a beautiful photo. The colors change from orange, pink, purple, aqua. 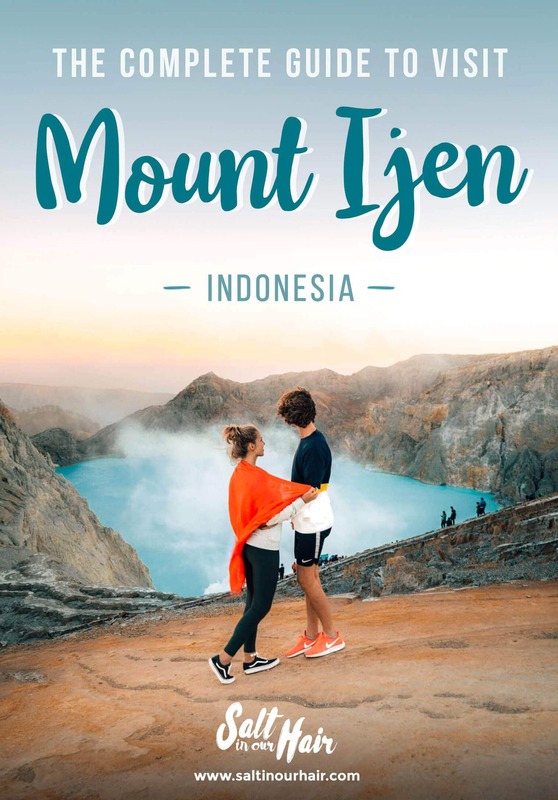 Would we recommend Ijen? It was a beautiful experience but wouldn’t recommend it if you have limited time for your route through Java. Did we mention it is freezing cold at Ijen? The temperature was 0-10 degrees but with a super strong wind. Which made it freezing and dangerous because people were blown over. What to wear during an Ijen tour? Be prepared to wear long trousers, socks, closed shoes, a shirt, and a jacket or multiple sweaters. Do remember you will be hiking for at least one hour so your body will get warm. Note: There are small push cars that you can pay to take you up. You will be pushed and pulled up by three men and will pay at least 700.000 IDR. We don’t support doing this as it almost looks like slavery going on on these insane climbs. You have a few options to get to Ijen. 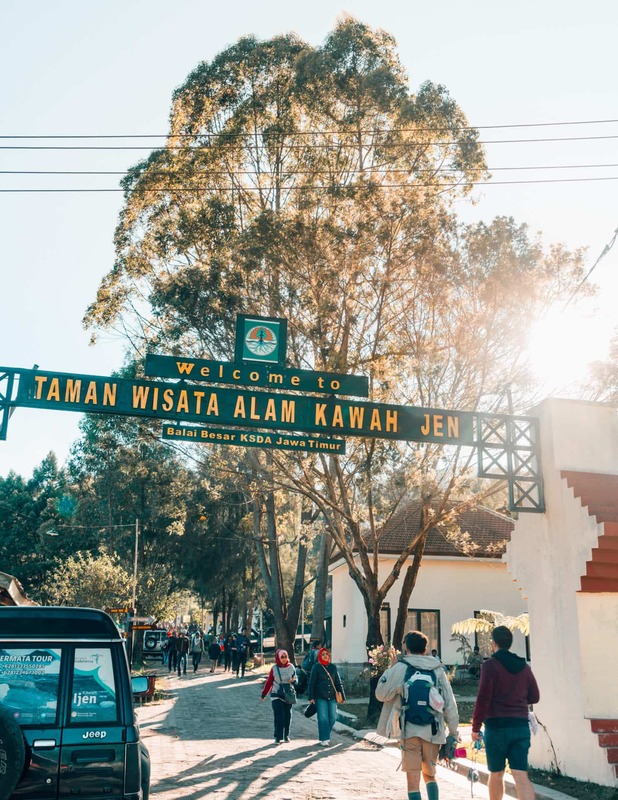 The easiest way is to find a guesthouse or homestay near Ijen. The best location would be in Banyuwangi. Another option is to stay in a larger city called Bondowoso. The only down part is that you have to drive for another two hours to get to the starting point of Ijen.